You have released us, O Lord, from the fear of death. You have made the end of life here on earth a beginning of true life for us. You let our bodies rest in sleep in due season and you awaken them again at the sound of the last trumpet. You entrust to the earth our bodies of earth which you fashioned with your own hands and you restore again what you have given, transforming with incorruptibility and grace what is mortal and deformed in us. You redeemed us from the curse and from sin, having become both on our behalf. You have crushed the heads of the serpent who had seized man in his jaws because of the abyss of our disobedience. You have opened up for us a path to the resurrection, having broken down the gates of hell and reduced to impotence the one who had power over deaths. You have given to those who fear you a visible token, the sign of the holy cross, for the destruction of the Adversary and for the protection of our life. God eternal, Upon whom I have cast myself from my mother’s womb, Whom my soul has loved with all its strength, To whom I have consecrated flesh and soul from my infancy up to this moment, Put down beside me a shining angel to lead me by the hand to the place of refreshment where is the water of repose near the lap of the holy fathers. You who have cut through the flame of the fiery sword and brought to paradise the man who was crucified with you, who entreated your pity, remember me also in your kingdom, for I too have been crucified with you, for I have nailed my flesh out of reverence for you and have feared your judgements. Let not eh dreadful abyss separate me from your chosen ones. Let not the Slanderer stand against me on my journey. Let no my sin be discovered before your eyes if I have been overcome in any way because of our nature’s weakness and have sinned in word or deed or thought. You who have on earth the power to forgive sins, forgive me, so that I may draw breath again and may be found before you in the stripping off of my body without strain or blemish in the beauty of my soul, but may my soul be received blameless and immaculate into your hands as an incense offering before your face. 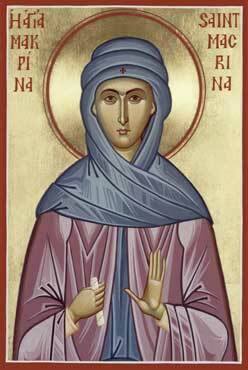 The Life of Saint Macrina, by: Gregory, Bishop of Nyssa. "A man may seem to be silent, but if his heart is condemning others, he is babbling ceaselessly. But there may be another who talks from morning till night and yet he is truly silent, that is, he says nothing that is not profitable." "Every day you provide your bodies with good to keep them from failing. In the same way your good works should be the daily nourishment of your hearts. Your bodies are fed with food and your spirits with good works. You aren't to deny your soul, which is going to live forever, what you grant to your body, which is going to die." "Remember, O my soul, the terrible and frightful wonder: that your Creator for your sake became Man, and deigned to suffer for the sake of your salvation. His angels tremble, the Cherubim are terrified, the Seraphim are in fear, and all the heavenly powers ceaselessly give praise; and you, unfortunate soul, remain in laziness. At least from this time forth arise and do not put off, my beloved soul, holy repentance, contrition of heart and penance for your sins." The candles lit before the icons of the Theotokos are a symbol of the fact that She is the Mother of the Unapproachable Light, and also of Her most pure and burning love for God and Her love for mankind.